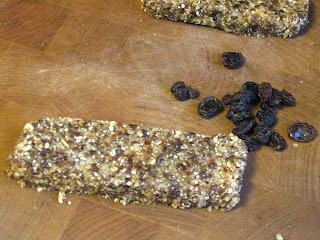 I found the original recipe for these little bar of yum over on Chocolate Covered Katie. I've been a fan of her blog for well over a year now because her recipes look (and the the ones I've tried are) delicious. What makes her blog different? It's a vegan blog. I'm not vegan, as you know, but when she adds egg substitute I tend to add a real egg, things like that. 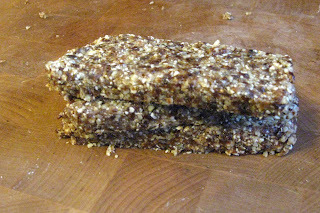 This is a recipe she came up with that makes 3 look-alike Larabars. It is claimed that they keep in the refrigerator for up to two weeks but I doubt they would last two days. I'm thinking about eating the third one as I'm writing this. I may be doing just that by the end of this post. Are you ready for a quick to-go treat that will bump up your energy and taste good?? 1. In a food processor, process oats until fine. 2. Add in the rest of the ingredients and process just until a workable dough that you can shape with your hand, about 8-10 pulses. 3. Shape dough into three bars. 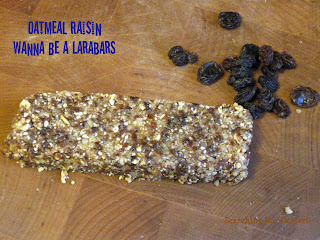 Eat immediately or refrigerate up to two weeks.